No better time than election season to usher in a parody of actual political happenings. Mr President (The Controversial Election) directed by Toka McBaror and produced by Shirley Ann Ede is a satire that puts up a mirror to society and takes numerous shots at everyone from the political class to the regular citizens who consider themselves too powerless to assert themselves. Set in the high octane, morally bankrupt power circles where the influential and wannabes come out to play at the expense of the citizenry, Mr President’s most impressive characteristic may be an unwillingness to take itself seriously at all. And that becomes the film’s saving grace eventually. McBaror is upfront about his limitations as a filmmaker and seems to understand that the story as conceived by Shirley Ann Ede isn’t the most impressive of narratives. Message movies such as Mr President have a tendency to get carried away by their good intentions. It usually isn’t long before the soapbox is mounted and the preaching kicks into overdrive. Mr President has some preaching up its sleeves and it certainly isn’t above laying out plenty of judgement but the bitter pill is dispensed with a spoonful of zaniness that makes it quite bearable. Having said that Mr President isn’t a good film, it is just self-aware enough to understand that a film does not have to be good to entertain its audience or serve its purpose. he purposes here being to send up society in the most disjointed way possible. In the opening sequence, the Nigerian president, Dalhatu (played with a splash of mischief by Saeed Funky Mallam) is addressing a nation that has been battered by years of non-performance and thievery from the leadership class. Dalhatu is at the tail of his first term and about to announce his candidacy for a second term. The President’s speech is intercut with a meeting where the main opposition political party is attempting to settle on a viable candidate to go toe to toe with the incumbent at the upcoming elections. Once this business is settled, the rest of the film concerns itself with detailing the shenanigans and back dealings that are characteristic of electoral season. 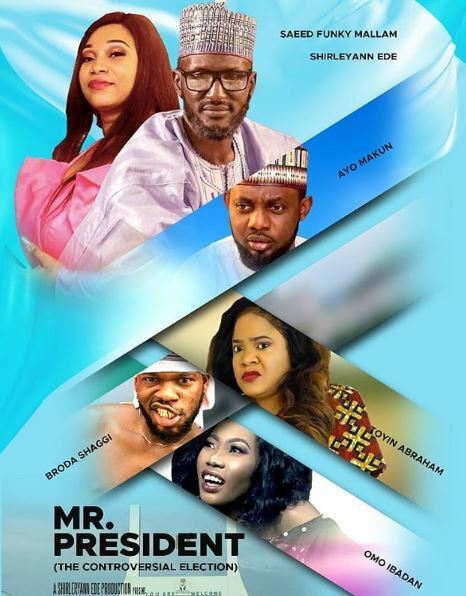 Some of it makes sense, a lot of it doesn’t but Mr President marches on clumsily buoyed by cameo appearances from superstars AY and Toyin Abraham, both in roles that go nowhere fast. Shirley Ann Ede as President Dalhatu’s main rival, Senator Ruth Abhuliem has a prominent role that suffers from both underwriting and the incapacity of the actress playing the character. Looking for bright spots? Some of the acting especially by Saeed Funky Mallam in the lead role of the clueless President Dalhatu is surprisingly decent and would definitely have been improved by more purposeful writing. Dalhatu’s character is obviously a mash-up of President Buhari and his predecessor, Goodluck Jonathan and Funky Mallam’s go for broke performance is in tune with the film’s madcap tone. The picture is crisp and costume colours are bold but nothing is interesting or exciting about McBaror’s direction. Matter of fact the screenplay would have been more coherent if he had managed to exert some authority on the project as opposed to the by the numbers approach that he opts for. Speaking of, the screenplay is a cluttered mess, swinging wildly and throwing everything but the kitchen sink into the mix hoping something, anything, will stick. Very little does. While this playful element serves the film well in terms of tone, it does not excuse the lack of a coherent plot. In some ways, Mr President plays out like the original idea was lost along the way as the screenplay was workshopped to fit into someone’s idea of what the Nigerian audience is likely to respond to. Mr President’s sound design- if it can be called that- distracts from the film instead of enhancing the experience as the extra judicious use of sound effects to force comic timing appears lifted from some amateur stage acting playbook. McBaror has a thing for aerial shots of Abuja and the capital city skyline replaces the now famous Lekki-Ikoyi link bridge for the award for establishment shot overkill. The Nollywood paying audience may be as fickle as those from any part of the world but if producers keep churning out silliness like this in the name of giving people what they want, it may be time for audiences to start speaking out clearly with their wallets.